How to find the Carter YF, YFA carburetor number? Which means finding the correct kit. internal vent connects the fuel bowl to the air horn. Some external venting is effected through the pump lifter link slot in the main body casting. Fuel enters the idle well through the metering rod jet shown. The low-speed jet measures the amount of fuel for idle and early part-throttle operation. The upper idle air bleed, fixed idle restriction, and lower idle air bleed are carefully calibrated and serve to break up the liquid fuel. The fuel is then mixed with air as it moves through a passage to the idle port and idle adjustment screw port. Turning the idle adjustment screw inward reduces the quantity of air-fuel mixture supplied by the idle system. The idle port is slot-shaped. 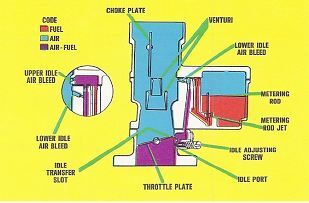 As the throttle valve is opened more of the Idle port is uncovered allowing a greater quantity of the air-fuel mixture to enter the carburetor bore. When no carburetor number is present, you may be able to identify your carburetor by using the casting number. Check balls are often placed in the wrong hole, so don’t assume you will find the correct size in the particular hole. The bigger check ball goes in the main discharge. Once the check balls are in place you will need to test them to make sure they seal correctly. Use a test fluid, like carburetor cleaner (NOT WD-40), and a small punch to gently hold down the ball on it’s seat and depress the pump in it’s well by hand. If you get a hydraulic lock then you are good to go. On holes other than the accelerator pump simply watch that the fluid doesn’t leak out. Some of our kits have two sets of needle & seats. One will be spring loaded and the other will not be. Try to use the spring loaded whenever possible, especially on off-road vehicles. The spring type of needle & seat keeps the float from bouncing on a rough road, which will allow too much fuel to enter the float bowl. .Find Carter YF main jet sizes here.